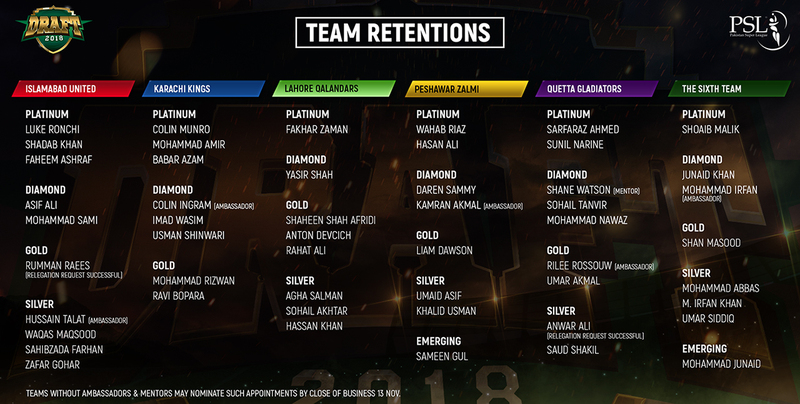 Pakistan Super League Retentions Announced! November 13, 2018: All six Pakistan Super League (PSL) teams have finalized their retentions for the upcoming season today. New signing Sunil Narine, who moved from Lahore Qalandars to Quetta Gladiators as part of a blockbuster trade, joins Pakistan captain Sarfaraz Ahmed to complete Quetta’s Platinum retentions. Star Australian all-rounder Shane Watson moves to Diamond as Player Mentor. Teams without Ambassadors or Mentors may nominate such appointments by close of business 13 November. The Player Draft will be held on November 20, 2018 and Pakistan Super League returns to action on 14 February 2019!